There is nothing sweeter than showing up to an event with a homemade cake. It’s a beautiful gesture that just screams, “I really cared enough to make this for you.” But, unfortunately, baking a cake from scratch is often akin to diffusing a bomb. Any little misstep can end in disaster...and it would be so much easier to buy a cake and call it a day. But a store-bought cake does not show the same amount of sacrifice and consideration. There is, however, one way to have the best of both worlds: boxed-cake mix! But you can’t just make a cake from a box the way it tells you to and think it’ll pass as homemade...no. You need to class it up a bit. That way no one will ever know how little effort you put into making it and they’ll definitely think it’s homemade. Not to mention that they’ll think you’re an amazing baker, even if, in reality, you’re quite the opposite, like me. Trick people into thinking you can bake with these 3 boxed-cake mix recipes! Mix the eggs, melted butter, and water into the boxed-cake mix. Grease pans and pour cake batter inside. Bake as instructed on box. Remove cake when finished and allow to cool for 1 hour. Once cooled, cut the cake into slices and layer half at bottom of serving container to create the first layer. Add ½ frozen strawberries and ½ fresh strawberries for the second layer. Add 1 container of cool whip and smooth flat with a spatula for the third layer. Repeat layers one additional time. Cut a single strawberry by slicing it up to but not all the way to the stem. Spread it flat to open the slices, and place on top for decoration. Mix the eggs, melted butter, and water into the boxed-cake mix. Add 1 tbsp cinnamon and mix in. Grease pans and pour cake batter inside. Bake as instructed on box. Remove cake when finished. Prepare the crumb mixture by combining the flour, brown sugar, softened butter, and 1 tbsp cinnamon by hand or fork. Crumble the crumb mixture onto the top of the cake and return to the oven for 10-15 minutes. Remove the cake and allow to cool 1 hour. Prepare the glaze by combining the powdered sugar and ¼ cup water. Drizzle on top of the crumb cake. Cut the cake into squares and serve. Mix the eggs, melted butter, and water into the traditional yellow and chocolate boxed-cake mix separately. Add the instant chocolate pudding to the chocolate cake mix and the instant vanilla pudding into the yellow cake mix. Add 12 oz sour cream into each cake mixture. Mix until combines. Grease pans and add ¾ yellow cake mix. Add ¼ chocolate cake mix to the top. Using a knife, create zig-zags into the batter to slightly spread and mix the chocolate with the yellow cake. (Remaining cake mix may be used to create a Reverse Marble Cake by placing chocolate first and yellow cake on top). Place in oven and bake 1 hour at 375° Fahrenheit. Remove from the oven, cool for 1 hour. Make glaze by combining powdered sugar with ¼ cup water and spread on top of the cake and serve. The Strawberry Shortcake was excellent. It tasted sweet and tangy, the cake was moist and fluffy, and the cool whip complemented the strawberry and cake by adding a cool creaminess. All elements together made it deliciously decadent, yet still light and refreshing. It was visually appealing and elegant too, which makes for a great dessert to take to fancier events like parties, sit-down dinners, etc...or take it to people you're trying really hard to impress. This beautiful layered cake will definitely get you on their good side. The Cinnamon Sugar Crumb Cake was even better than I had expected. 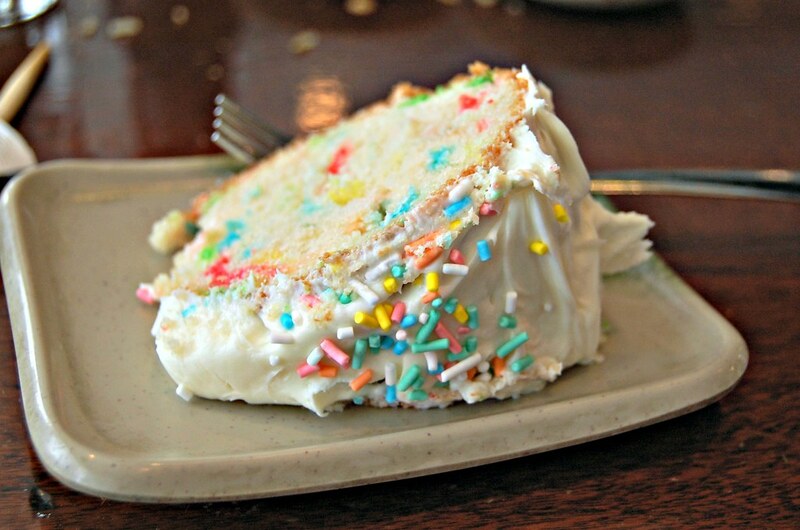 The cake was soft, fluffy, and airy. The crumbs were sweet and crunchy, yet soft and chewy on the inside. And the glaze added a burst of extra sugary sweetness between bites. It would go excellently with a hot cup of coffee or tea, or simply by its delectable self. The Moist Pudding Marble Cake…did not go as planned. Probably because I attempted to get creative with the recipe, which is always a no-no when baking. Always. Follow. The. Recipe. Somehow, I find myself thinking, time and time again, that I can be Houdini in the kitchen. Adding one thing here, substituting another there...unfortunately, the magical arts of baking were not on my side this time. It tasted fantastic. It was absolutely "moist", as the recipe claims, and the combination of vanilla and chocolate made for delicious surprises with every bite. But the texture was an absolute flop. It was far too dense for what is expected of a cake. Perhaps it would be much better eaten hot and covered in ice cream. At least it made for a fun experiment and a great laugh, because to make it through this life, we have to be able to laugh off our mistakes every now and then; even the small ones- like a mushy, dense, pudding marble cake fail.